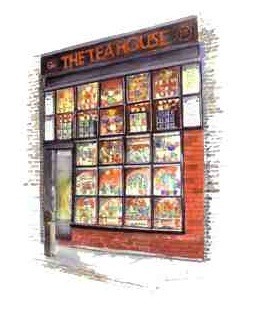 I don't know if teaphernalia is a word, but it is an effective way to describe the wares of The Tea House. As they want to you understand from their word, they sell tea, but not just any tea, and all the bits and bobs that go towards making the perfect cup of tea at home. Both inside and out it looks like they get their teas shipped from the orient, and are able to provide you with the best teas from China, Japan and even more exotic climes. While they probably still get some of their teas from the east, they also sell teas made by local producers though – the range runs from Twinings though to loose leave varieties from single estates. And of course teas are priced accordingly. If you like the basic stuff then this is where you can get it in the nicest tins, but if you do have particularly fussy taste is tea, or love those flowering teas, then you can pick them up here as well. Covent Garden is a bit 'gifty' and a bit touristy, so prices might seem a bit steep, but you're here for the range – and of course very reasonably priced teaphernalia that you can't find on every high street. Strainers of all shapes and sizes, tea cups in glass, fine china or thick pottery, wonderful tea tins and all manner of other tea preparing utensils, there's enough here to perform a proper Japanese tea ceremony, or make the perfect cuppa for someone particular about their brew being served at the right temperature and having the perfect strength of flavour.